all left today. I was surprised by how emotional I was after Ruby left. I really loved that horse, even if she didn't love me, and I shed some tears when she was gone. I feel like an era in my life has ended. The sadness is tempered by the fact that she as well as Amy and Scooby are going to great homes. I hope that Samantha will grow to love Ruby like I did. I HAD A GREAT DAY AT WORK!!! Last weekend was very relaxing. I read a lot and drove to soccer games. Ben's game was very exciting against the bigger and older boys. They crushed them 6 to 2. Ben and I went to visit Kirsten's farm on Sunday. This is where Amy and Scooby will be living. I was happy with the facility and the condition of the horses. A little worried about the mini donkey though. Speaking of donkeys...I haven't been able to visit Pickles and JoJo and I really want to see them. I haven't seen them outside either so I hope they are okay. A lot going on this week. Meeting tomorrow morning, buddy breakfast friday morning, girl scouts thursday night and our classroom party. I was feeling pretty proud of myself for having everything ready to go for this week. Forgot the doughnuts for Friday though. Ruby, Amy and Scooby are all leaving on Saturday. I feel like I should be sad and upset about saying good bye, but really I just feel relief and happiness that I have found them good homes. I am excited for Samantha to enjoy Ruby and love her like I did. Maybe Ruby will love her back. She certainly didn't care for me. I am also happy that Kirsten is so excited to have Amy. I think the kids will really enjoy riding her. She is the perfect lesson pony. George and Linda are debating whether to buy our whole herd. It would be great if they could all go to the same home. Its a lot to take on though especially with the goats they already have. I also have an offer for Holly and the chickens. Work is still work. Very stressful. I am biting Mark and the kid's heads off at night. I really need to find a way to zen through this year. I am excersizing now so maybe that will help. What a crazy week leading up to today. The plan was for us to go camping at Beaver Creek this weekend for Halloween. I was really looking forward to it since I haven't camped at BC for a long time. I wasn't looking forward to the cold though. Our furnace broke and I wasn't sure if we were going to be able to have it fixed in time for our farm sitter. I didn't want her staying here without heat when it was going to be so cold. So, I gave her the heads up on that. Wed. I got word that yes, it could be fixed on Friday. Camping is a go. Then Amanda called on Wed. night and said that Chris' grandpa had died in a car accident and she asked if I could come down to watch the boys so she and Chris could fly to Florida for the funeral. Of course I said yes. The only caveat was that I couldn't leave until Friday afternoon because I had to get an echocardiogram and Scooby was going to be gelded so I needed to keep an eye on him for a couple of hours. All good. Then our farm sitter texted me that she was in the hospital and didn't know if she could do it. Then our car broke. URGH! Thursday night. Farm sitter can come, but car is not fixed so Mark, Finn and Tali will not be able to go camping after all. Friday morning. Vet is NOT able to geld Scooby until Sat. so I will not be home for that and Mark will have to take care of everything. Mark is sick and glad that they are not going camping. In a few hours I will head down to Columbus and hang with Ben and Leo. They both have criss-crossing soccer tournaments and various people are picking up and dropping them off at all different times. This should be an interesting weekend. We had a great weekend with family to celebrate Finn's 8th birthday! We went bowling on Saturday at the Oberlin College Lanes. It is a very small alley with only 6 lanes, but perfect for a birthday party. Unfortunately only 1 of Finn's friends came. I think it was because it was a busy soccer Saturday, but it would have been nice if the parents would have at least let me know they weren't coming. Finn's face was so sad as he waited for his friends that never came. It broke my heart. Luckily, Gabriel showed up and then came Auntie, Hannah, Ben and Leo. They took his mind off of it and we were soon all happily bowling. It was actually nice to spread out over the 4 lanes and probably would have been much harder to get everyone on a lane, so that was actually a plus. We had pizza and cake, and then they turned on the Glow Bowl, which was a huge hit with the kids. It made Amanda and me a little nauseous though. Mom showed up and we headed home a bit later. Dad and Eileen, and Dad came over and we hung out as we usually do and had some food and drinks. Finn got lots of Legos and Transformers. The boys spent most of the time building with the Legos. Amanda and the boys left today, and Mark and the kids and I went to Barnes and Noble to fix my Nook. Took about 40 min. but its finally working properly. I really, really love it. Dad put Rosetta Stone on my computer and Tali and I began our lessons today. I love how interactive it is and Tali was very excited when she got parts of it right. When we got home from work today Dolly was clearly in standing heat. She was down by the buck pen, along with all the other hussies, teasing and taunting the boys. We locked up the girls, got Dolly on a lead and enticed Uno to come out of the pen and have his way with her. She took it like a pro. I hope she settled, but we will follow the same procedure tonight and tomorrow. After a cigarette break we put Dolly, Raisin, Holly and Amelia in the barn pen and let Samurai out to stay with Ivy and Juliette. That was a lot of running around and moving of goats. Took up most of the night, but all goats are with who they are supposed to be with and since we are "driveway" breeding Dolly to Uno that meant that Uno could stay with Romeo. Phew! I had a moment of indecision when I considered breeding Raisin, Holly and Amelia to Samurai as well, but then I came to my senses and thought about the bother of trying to sell the babies in the spring. This week University students come to work with our boys. Preconference info is due, the kids don't have school on Friday and I have a PD the same day. Thursday is Girl Scouts. Friday, Oscar is going to his new home. :( Saturday is Finn's birthday. In between all of that I have to somehow bake a cake, order cake and pizza, and buy Finn's birthday gifts. Another Phew! Today was just as busy as yesterday. I was going to go grocery shopping at 10:00 and I should have stuck to my plan. Instead I got the great idea of taking the kids to the Wooly Bear Festival. What a nightmare. After parking and waiting in line for the shuttle we got on the bus. It had no air conditioning and none of the windows would open. I got an instant headache bloom and felt like I couldn't breathe. When we pulled up behind the other bus to unload the driver would not let us get out because he had to let us disembark exactly where the other bus was letting out passengers. Even when I told him that I wasn't feeling well and asked him if we could get out he said no. Ridiculous! I told him that if I threw up on his bus he would have an even bigger problem. Jerk. So, then we waded through 100,000 people all crammed into a 4 block radius. This is the biggest one day fair in Ohio. Wish I would have read that before we left. I held onto both of their hands and we tried to move through the streets. It was impossible. After about 5 minutes of this I asked Finn and Tali if they wanted to leave. They both said, Yes! Then we tried to find somewhere to eat lunch, but everything was crowded. It was a crappy morning all around. Dad came over and tried to install the spanish Rosetta Stone, but it just won't work. John and Holly came over to get the donkeys. Another fiasco. Pickles went in the trailer but only after we man-hauled her in. JoJo would not go in for anything. We tried to put a rope behind her, but she fought and fought and started slipping and panicking. It sucked. Finally we moved the trailer up onto the cement and she walked right in. Geesh. I rode with them in the trailer. JoJo looked out the window and shook, but she took it pretty well. Pickles leaned back on the halter the entire ride. She did not let up the pressure once. When we got to their new home they walked into the barn and were greated by Radar, a ginormous white mammoth gelding. Radar wanted to climb over the walls to get them. He pawed the ground and was very obnoxious. I hope he doesn't hurt them. He seems pretty crazy. Mark and Pat worked hard today again scooping manure and flattening the pasture. Pat dug out the goat pen. I will put the girls and guys in together tomorrow. We had a lot going on today. Our new realtor came today at 8:30 and we think he is going to do a good job. We hope so anyway. By early next week we should have an idea about how much to ask for the property. Then Pat, Tali and I went to the passport place again to get Pat's paperwork going and to redo my pictures. Of course, after I redid them today I found the originals when I got home. Figures! But I am happy to say that everyone's paperwork is in the mail. I have a feeling that we are going to have to do some extra work for Finn and Tali, but I've got my fingers crossed. Oh, I forgot. The tractor was delivered at 9:00 so Mark has been busily pushing manure and rocks around all day. It is still super wet so we didn't make as much progress as we had hoped. Tomorrow is grocery shopping, more cleaning out of closets and packing. John is coming to get Pickles and JoJo around 1:00 and Dad is coming over too. Samantha is coming over at 3:30 to lunge and ride Ruby. 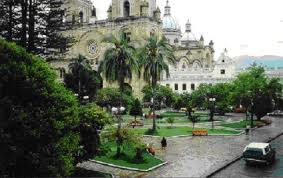 We got the video about Cuenca and I have watched it twice so far. It is a good representation of things you need to know about the area. Some good, some bad. But it did get me excited to visit in Dec. I really need to work on my Spanish. Ruby, the donkeys, Amy and Scooby all have found happy homes!!! I am so relieved. Ruby is going to the same family as the donkeys, but will live at a different farm down the road from them. A 19 year old girl, Samantha, who reminds me of me will now love Ruby like I did. Scooby is going with Amy and will be used in a birthday petting zoo until he is old enough to train to ride. I can't say how full my heart is now that I have found all of my equine lovies good homes. Today is a good day. I booked our stay at the Hotel Otorongo. It is a very quaint hotel/apartment complex on the Tomebamba River. Each unit has a little kitchen so that we may still cook should things get crazy during the holiday festivities. For a two week stay the cost is $450. Amazing. I also booked our flight. We are going to fly through Miami to Guayaquil. 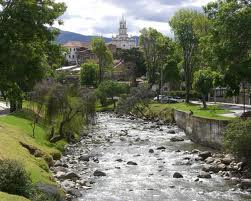 Then we will take a 4 hour van ride up the Andes Mts. 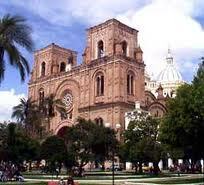 to Cuenca. I am looking forward to staring out the window. I hope its a clear day. Last week we cleaned out the red shed to use as a staging ground for a garage sale and for boxes labeled Goodwill or Keep. Yesterday we began to work on the closets and upstairs. Its amazing how many articles of clothing I don't wear that I must have lugged with us when we moved here 4 years ago. But this time, out they go! A Goodwill store opened at the top of the street, which seems awfully serendipitous to me. The sun finally came out, so after breakfast I am going to walk Scout who is looking like a little blimp and then I'm going to continue with the upstairs. My goal is to finish it this week. John is supposed to bring a deposit for the donkeys today and they should be going to their new home down the street next weekend. I'm happy that we will be able to visit them and make sure they are okay before we leave. Next weekend Ivy and Juliette will go into the barn pen with Samurai, and Dolly will be penned with Uno. I stupidly sold Mr. Tumnus not thinking that I would still need a wether. Now we have to ask our neighbor if she will let us borrow their Nubian wether, Frankie, to put in with Romeo so that he won't be alone. I wish someone would take Romeo already. Some lady wanted to buy the three does left and Romeo, but she didn't want to breed them. I kept telling her that they were too valuable to not breed, but she still asked if Romeo could be banded. Finally she got the message. I didn't understand her wanting mini-Nubians that she wouldn't breed. Weird. A little girl from Firelands is interested in the chickens. She will be stopping by this week. I'm ready for them to be gone too. All they do is sit on the side porch when it rains (which it has been doing forever it seems) and poop all over the place.